I'm back to draw our winner from our May "Boys & Men" challenge. We really appreciate each entry we receive! So thanks for playing along and we hope you will join us again. Next month we have a fun prize up for grabs so stay tuned for that! We used Random.org to choose our winner of a $25 gift certificate to the OCS store. *Please note that Canada's postal service is on strike and there will be delays in shipping. Please email Lora (lora at onecrazystamper.com) to claim your prize. Our June Challenge will be posted tomorrow, you won't want to miss this! Today I'm sharing a card for One Crazy Stamper that I've had in my mind for a while! I wanted to make this adorable bear from the Popcorn The Bear Christmas Collection into a sweet baby card! I paired it with the My Mind's Eye Tickled Pink Collection. I colored the image with the Copic markers shown below. So...I hope that you have been inspired to think of your stamp sets in a different way! Wishing Americans a Happy Memorial Day! 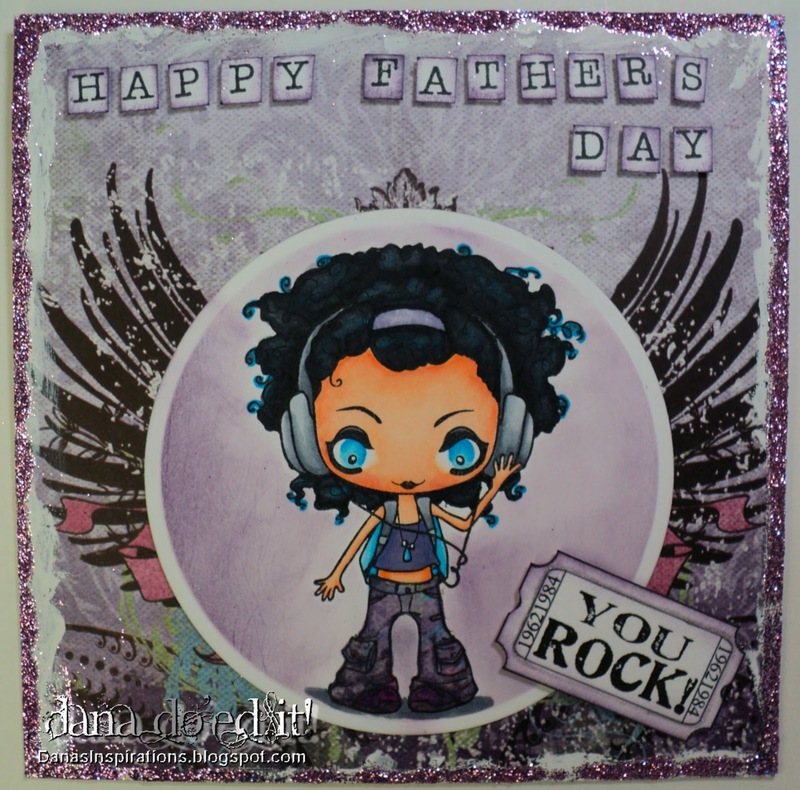 It is Sue here and for my last post of the month and as Father's Day is almost here, I used this really cute stamp from S.W.A.L.K. from Crafter's Companion called "Best Dad". This is an unmounted stamp, which I mounted on EZ mount static cling foam and used the Hot Craft Knife to trim it; an awesome tool to have. 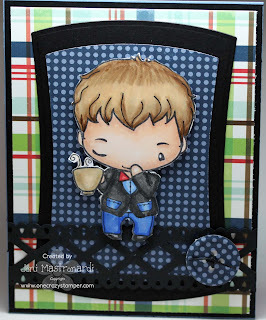 Paper: X-Press It Blending Cardstock, Core'dinations cardstock, Basic Grey "Marjolaine"
There are only a couple of days left to enter this month's challenge (Boys and Men). Wednesday, June 1st is the start of a new challenge. All supplies can be purchased at Lora's store One Crazy Stamper. Labels: Copic markers, Hot Craft Knife, One Crazy Stamper, S.W.A.L.K. OMGosh have you seen the NEW items!!!! One Crazy Stamper now carries Bellas!!! Woo Hoo! I am a huge fan of this company and need to add on to my house to just hold this companies stamps. So of course I had to use Avery! She is sooooo adorable and fun to color. I tried a new shadow technique I have seen and I definitely need some more practice but that means more playtime with all the new goodies! Of course Lora will be having even more new goodies in the coming weeks so keep your eyes open for some new goodies and run don't walk to splurge in the store! I used my scor-pal to make the background. I really need to upgrade and get the new one Lora has in the store! It looks fabulous!!! I also used some twine the store carries some very cute colors as well! Love this stuff so much! 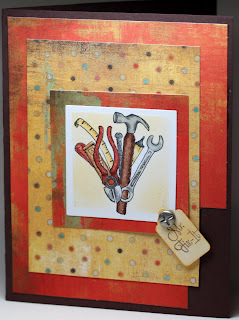 This month's Challenge at One Crazy Stamper is "BOYS & MEN". We want to see a card you would send to a guy. We'd love if you would play along. Hi, It’s Jacilynn here today filling in. First of all I want to say a big thanks to Kathryn from our Design Team. She will be stepping down from the team to focus on her family and we want to say Thanks for all the inspiration you've provided to us! I used some older Basic Grey papers on my card today. And I really love these colors together! The teal, brown, orange combo is one of my favorites…infact I’m itching to use it again soon. 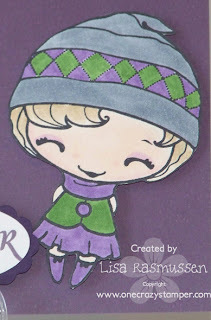 My stamp is from The Greeting Farm called OA My favorite things and I colored her up with my copic markers. I used my nestabilities for the oval frame and all the circles. So what’s your one of your favorite color combos? Hi everyone, Madge here! Happy “over the hump day”……… Of course, when you’re retired every day is a Sunday, right? Except when a holiday is thrown in and “yikes”, it’s Tues. already!! I chose this stamp from One Crazy Stamper a couple of months ago – and can’t seem to find it in the store…….. It is called “Gone Fishin’”. I made this with the intention of doing something very fancy and wonderful, but then decided that it would be an ordinary card. A very good friend of ours turned _ _ and he loves fishing! and has a sweet little white dog that sometimes accompanies him. Thought this image was very appropriate. 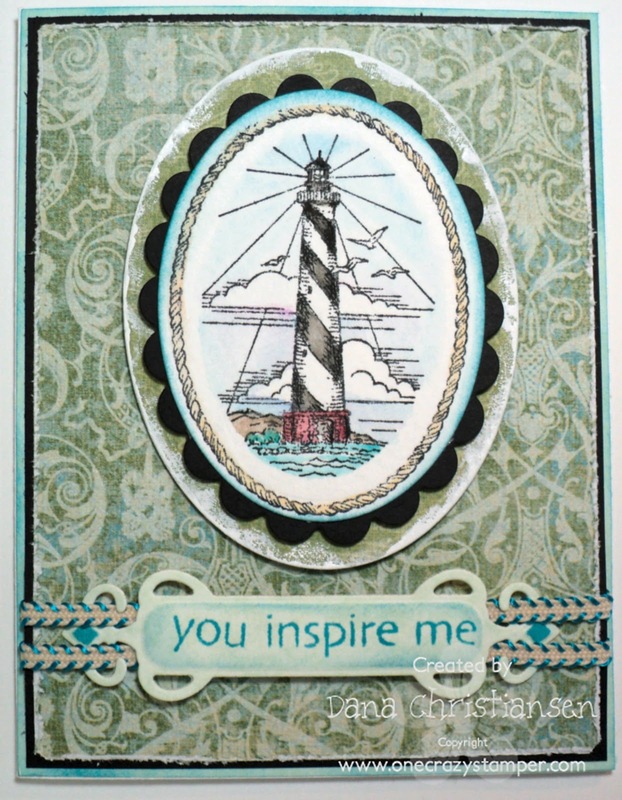 Materials: Express Blend it copic paper, Broken China and Tea Dye Distress inks, Gone Fishin’, Copics, Deckle edge Spellbinders die, DP from stash, EK Success dragonfly punch, Fish buttons from stash, Very Vanilla and Marina Mist Cardstock from Stampin’ Up. Have a great rest of the week! and……….. stay tuned for some marvelous news!!!! 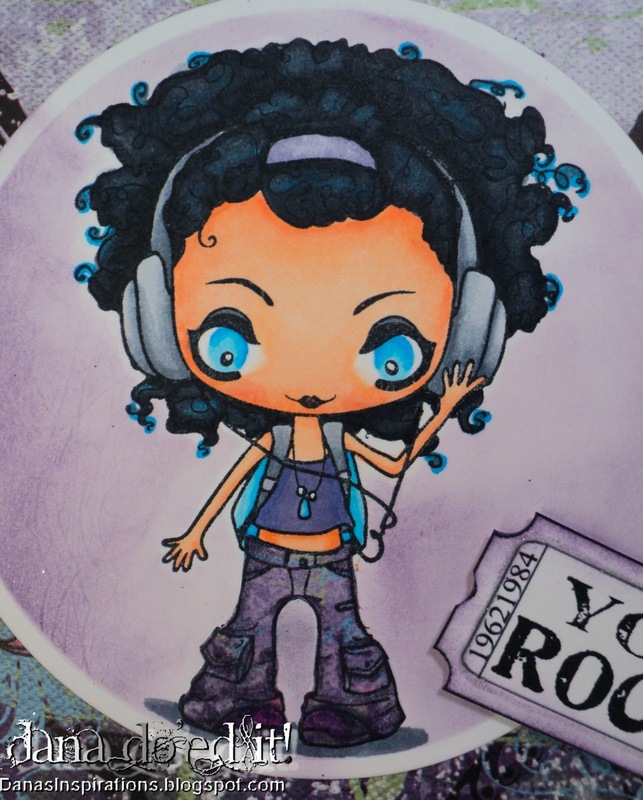 She was stamped with Memento Ink in Tuxedo Black on Copic Xpress It Blending Card before coloring her with my Copics. I use Sketch markers but all copics regardless of the style of marker you use have the same ink. I will say I do have a couple of the original copics and they came in really handy with their hard points to do her eyes. 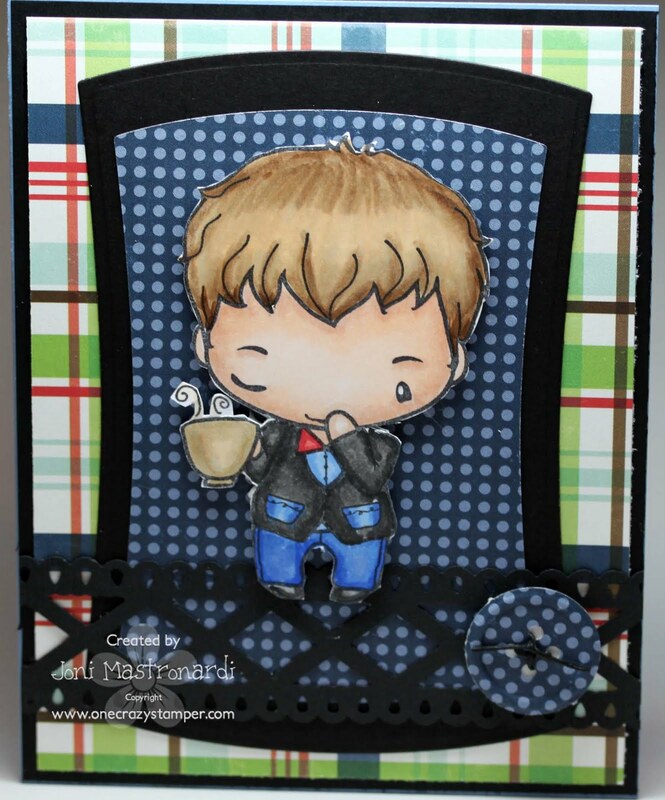 I only used one Spellbinders Nestabilitie Circle instead of layering like I normally would do. That was because I wanted a lot of those wings to show. 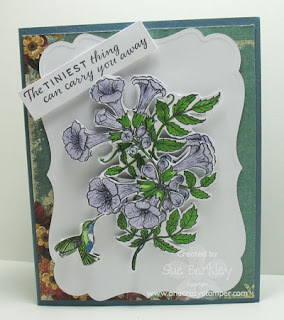 I did lots of distessing with Tim Holtz Distress Ink in Dusty Corcord. I love how muted and subtle that shade is. Oh, and how could I forget the Art Institute Glitter? I have a few more close ups (I just can't help myself!!) on my blog. There's still plenty of time to enter our challenge this month. I also want to publicly extend my congratulations and heart felt cheers for Lora and her family for their new endeavor!! I sure wish I was closer so I could come and browse through her soon to open brick and mortar store!!! Woo Hoo!!! Can you imagine just how many more goodies she will be bringing to us now that she has more room to store them? 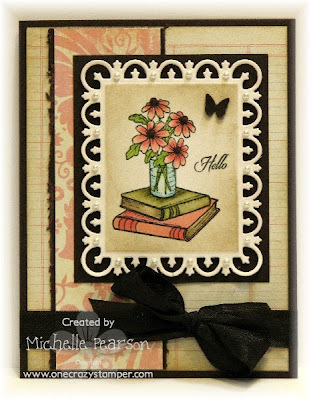 Today's card features the Flourishes From The Desk Of for One Crazy Stamper. I colored my image with Copic markers pictured below. 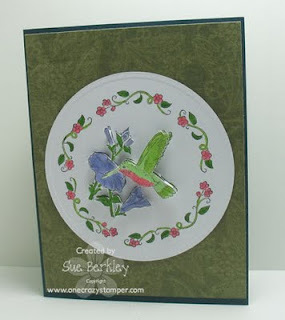 It is Sue here and for my post today, I am doing my first tutorial which is a 3D or Decoupage tutorial. For the main card I used the Humming Along stamp by Flourishes, and for the other examples I used the Backyard Birds by Just Rite. These can all be found at Lora's amazing store One Crazy Stamper. 1. Stamp several copies of the images that you want to use. 2. The image on the left will form the base for the card. 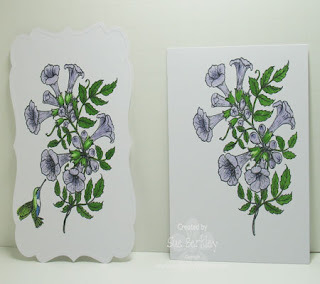 For the second image cut around the flowers and leaves using an exacto knife or a small fine pair of scissors. Cut around the flowers only in the next image, and then just cut the humming bird out. 3. Colour all the images using the same colours that were used on the main image. 4. Assemble the base of the card first, as the layers will be built on this. 5. Mount the image that has been cut out around the flowers and leaves using the foam adhesive to the main image on the card. 6. Attach the flower only part to the previous image using the 3D adhesive. 7. 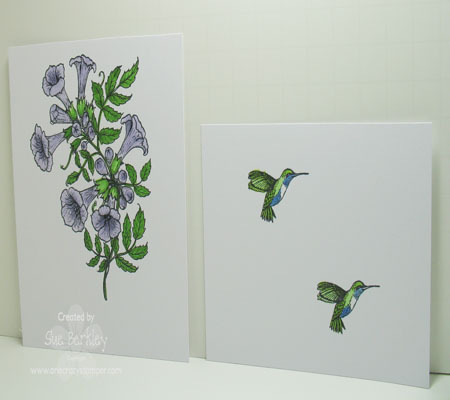 Adhere the cut out humming bird to the humming bird that is on the base of the card using the 3D adhesive. 8. Attach the phrase to the card. This technique can be used on many types of stamps. 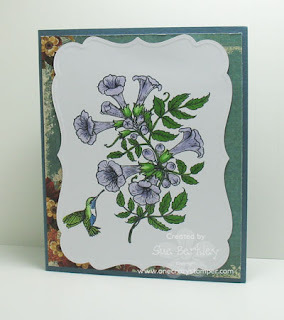 Below are examples using the Backyard Birds stamps by Just Rite. 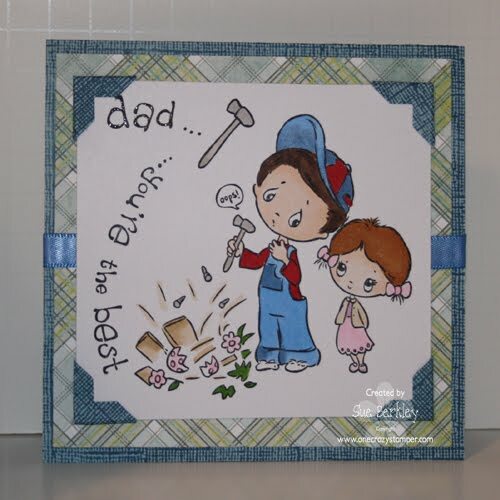 This stamp set has to be used with the 3 1/4" wood stamper. All supplies can be found at Lora's One Crazy Stamper and she certainly has amazing stuff. Don't forget that you have until the end of the month to enter our challenge which is Men/Boys. Hi all. If you have visited my personal blog you may know that my long time friend (known her since 8th grade) was diagnosed with Hodgkin's Lymphoma cancer last November. She actually started chemo the day after her 30th birthday. Well I am happy to report that today she is in full remission and has had two clean PET scans which is remarkable. Sometimes in this fight it is hard to think of what you can do for another person but the best thing is to just be there. We realized that we celebrate so many milestones in life-Anniversaries, birthdays, weddings-that maybe we should celebrate the biggest milestone of all--Life! So today why you are perusing blogs, my friends and I are hosting a celebration of life party in honor of my friend Amanda. We know that although laughter is not cure it sometimes IS the best medicine, so we will have games and the prizes are all known cancer fighters. 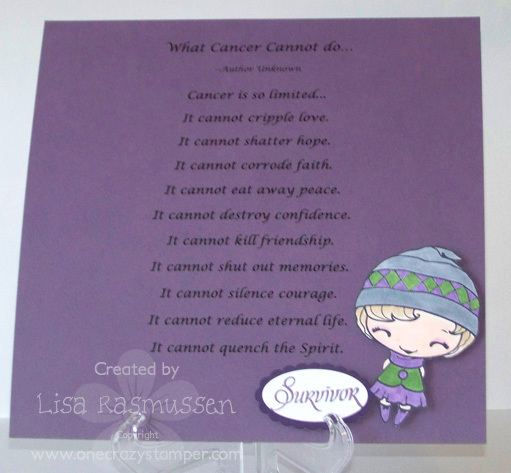 The ribbon color for Hodgkin's Lymphoma is lavender and Purple in general is the color for cancer. So my house is overblown with purple right now. Which leads me to this weeks project. We are all doing scrapbook pages of messages to her and this is the beginning of the book. This great poem about all that Cancer cannot do was found on the web and I knew I had to use Beanie Anya because Amanda wore a beanie all winter long after she shaved her head. If you look close you can see that I altered Anya. The original image has two long pig tails so I just trimmed them out of my image and colored away with my copics. Hope you enjoy this weeks project! Have a fun and crafty Day! 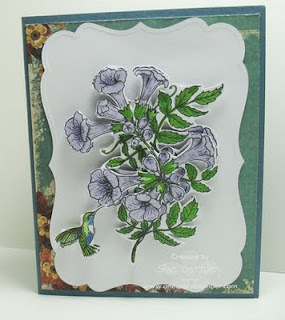 For today's card I used the tools from Flourishes Mix 'N Mugs. 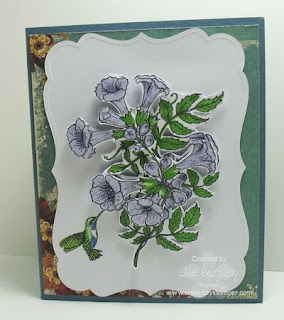 Today I used Flourishes Mix 'N Mugs to create this masculine card. 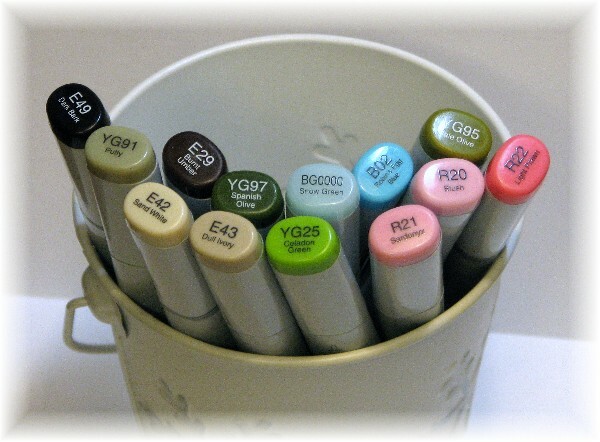 I colored the tools with the copics pictured below. I stamped my image with Memento Tuxedo Black ink on Xpress It cardstock. I airbrushed the background with Y23. I attached a little tag with the "Mr Fix It" saying. Check out our masculine challenge at our Blog. 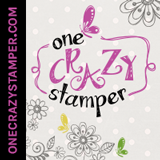 You might win a $25 gift certificate to One Crazy Stamper. Hi all, Madge here with some Tall Wishes for a Birthday Card for my son-in-law. (who happens to be 6’4”, dark and very handsome – 15” taller than me – so very tall). 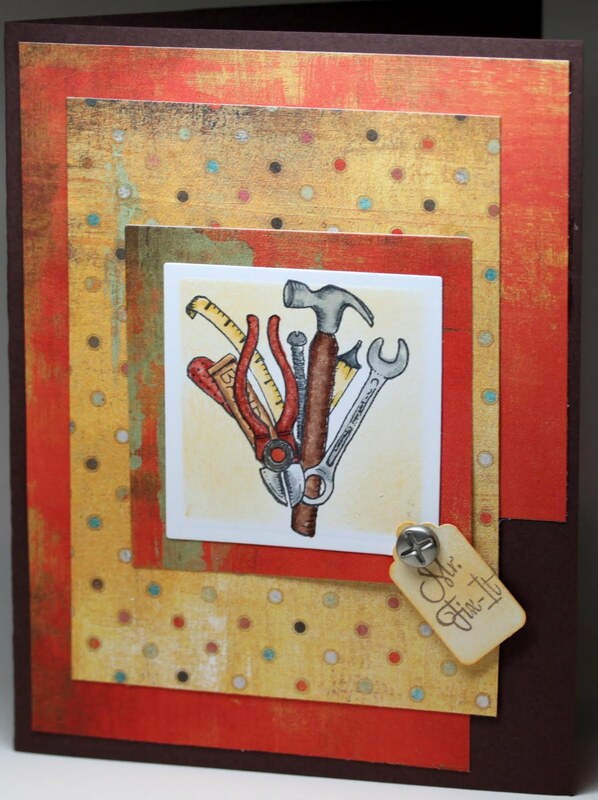 The masculine theme fits right in with the May “masculine” challenge at One Crazy Stamper. I’ve used a variation on a graduated tri-fold card. Normally the card would be cut from the Top right to the middle of the left side of an 81/2” x 11” piece of cardstock, creating an angle cut and two cards. I chose to cut down each of the thirds on the fold to create a level. I really love these zany animals from the Whimsy Animal Collection. Lora has them all in her summer clearance right now. My copics were used to color the “cheeky” Giraffe. 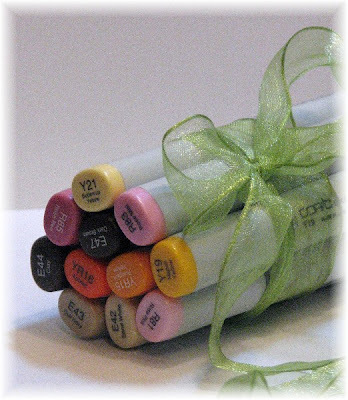 Speaking of copics, there will be an increase on copic products August 1st 2011. 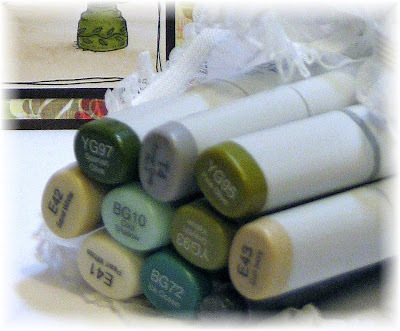 If you are needing any colors now is the time, while the pricing is low. Materials used were: Whimsy Giraffe; Copics; Tuxedo Black Memento Ink, X-Press it Blend Copic paper; Jillbean Soup Twine; misc SU Designer Paper, Cardstock and stickers. 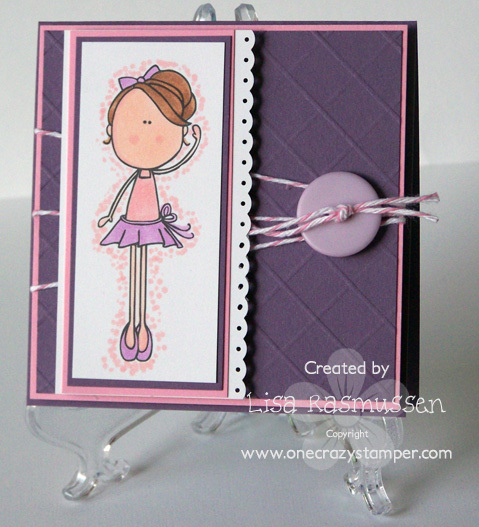 Hope you will join us in the May challenge at One Crazy Stamper you just might win One Crazy Stamper $$$. We all love to see what you come up with! 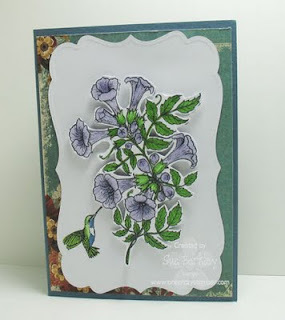 It's Tuesday so that means it my turn at bat to show you some of the wonderful items you can find at One Crazy Stamper! 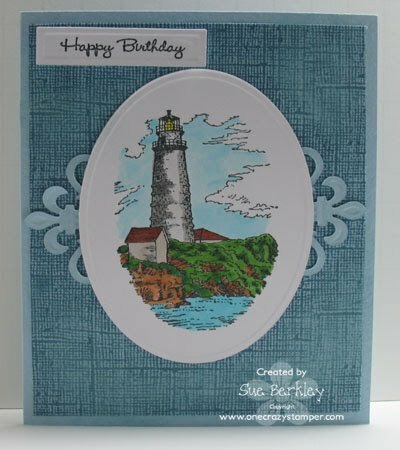 One again I've used this amazing set from Just Rite Stampers - By the Sea. This set is so amazing and versatile. You get four different scenes and 4 different borders for endless variations. 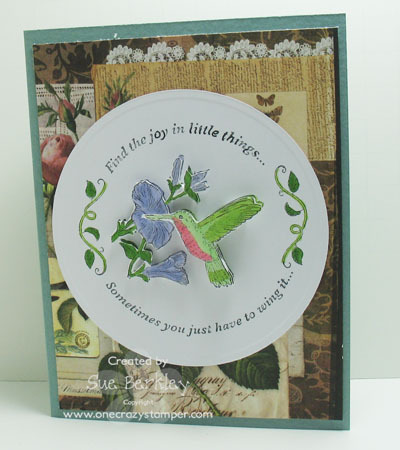 If you are new to Just Rite Stamps this is one of the originals and requires the Wooden Oval Stamper which provides perfect stamping time after time! I used Staz-On ink this time because I opted for watercoloring this image for a nice change. I used a variety of oval and scallop nestabilities for layering the focal image. 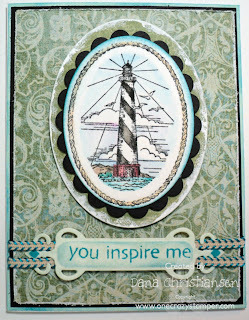 The edges and sentiment have all been distressed with Tim Holtz Distress Ink in Broken China. I framed my image with a Spellbinders Fleur De Lis Rectangle die. 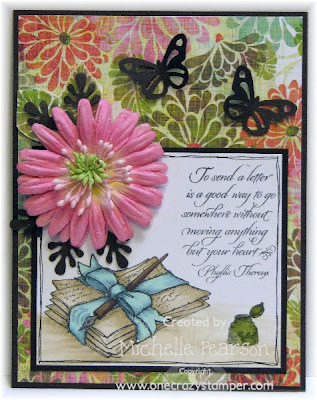 I used some Tim Holtz Frayed Burlap Distress Ink to distress my image before removing it from the die. The designer paper is from the My Mind's Eye Tickled Pink Collection. Eye Spy a Spring Clearance Sale! !